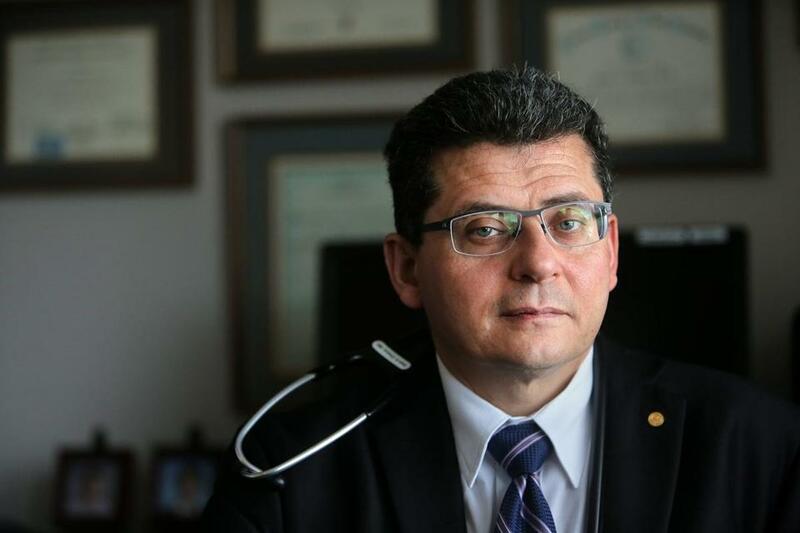 Dr. Alain Chaoui co-authored a new report on physician burnout. 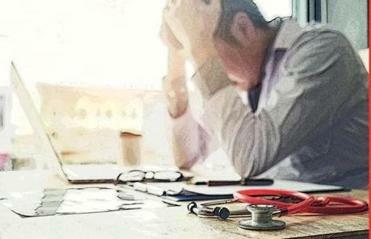 Physician burnout has reached alarming levels and now amounts to a public health crisis that threatens to undermine the doctor-patient relationship and the delivery of health care nationwide, according to a report from Massachusetts doctors to be released Thursday. The report — from the Massachusetts Medical Society, the Massachusetts Health & Hospital Association, and the Harvard T.H. Chan School of Public Health — portrays a profession struggling with the unyielding demands of electronic health record systems and ever-growing regulatory burdens. It urges hospitals and medical practices to take immediate action by putting senior executives in charge of physician well-being and by giving doctors better access to mental health services. The report also calls for significant changes to make health record systems more user-friendly. While burnout has long been a worry in the profession, the report reflects a newer phenomenon — the draining documentation and data entry now required of doctors. Today’s electronic record systems are so complex that a simple task, such as ordering a prescription, can take many clicks. Nearly half of all physicians experience burnout in some form, and the number will continue to grow. Medicine has become more regulated and complex over the past several years, generating what doctors often consider to be meaningless busywork detached from direct patient care. That’s when they start to feel disheartened, authors of the report said. Chaoui and the report’s other authors reviewed dozens of studies to develop their paper, which they described as “a call to action” for providers, insurers, government agencies, and health technology companies. The report does not specifically address burnout of nurses or other health care workers — only doctors. Surveys indicate that 50 percent to as many as 78 percent of doctors have at some point experienced burnout — described as emotional exhaustion and disengagement from their work — as they contend with the realities of modern medicine. Doctors must comply with a host of federal reporting requirements and insurance company rules. As insurers set tighter restrictions aimed at controlling costs, for example, doctors spend more time on the phone to persuade insurers to reimburse them for certain tests and services, they say. And much of the day is spent typing, pointing, and clicking in electronic health records, which are notoriously time-consuming and difficult to use. While doctors acknowledge that electronic records hold many advantages over paper charts, they say computers have become an obstacle — literally — that can hinder conversation with patients. Chaoui consulted with patient Samantha Martens. Studies show that burnout has costly consequences for doctors as well as patients, and for the health care system as a whole. When doctors are less engaged, patients are less satisfied. Burned-out physicians are more likely to make mistakes. They’re also more likely to reduce their hours or retire early. This affects their employer’s bottom line: Each departing doctor costs as much as $500,000 to $1 million to replace, according to one study. In a national survey of doctors published last year, 10.5 percent reported a major medical error in the prior three months. Those who reported errors were more likely to experience burnout, fatigue, and suicidal thoughts. To tackle the problem, the report says, physicians need access to mental health care without stigma or fear of losing their right to practice. The authors argue that state licensing boards should not ask probing questions about a physician’s mental health but focus instead on his or her ability to practice medicine safely. Asking doctors to manage their feelings on their own is not enough, the report says; it demands that major health care organizations take burnout seriously by hiring a chief wellness officer — a senior executive in charge of tracking burnout and helping to improve physician wellness. “We think the responsibility lies with the system that has created these problems,” not with individual doctors, Jha added. In response to the burnout “epidemic,” officials at Stanford Medicine in California hired Dr. Tait Shanafelt from the Mayo Clinic as their first chief wellness officer in 2017. Stanford also trains doctors from around the country in physician wellness. Shanafelt said his job is to identify “problem areas” and develop a coordinated approach to address the problems. “Part of our role is, when other key strategies or initiatives are being discussed, [to think about] the concept of how they’re going to impact our people,” he said. Physician burnout has spawned numerous studies that have raised awareness of the issue in recent years, and several Massachusetts health systems have begun working to address it. Last January, Boston Medical Center named Dr. Susannah Rowe, an ophthalmologist, to the new role of associate chief medical officer for wellness and professional vitality. Hospital officials said they are working on initiatives to reduce administrative burdens for doctors and implement flexible work schedules. Brigham and Women’s Hospital asked its physicians how they felt about their work in 2017 and plans to repeat the survey this year, though it has not published the results. “We’re really in this to make our physicians professionally fulfilled — not just stop burnout,” said Dr. Jessica C. Dudley, chief medical officer of the Brigham and Women’s Physicians Organization. Based on physicians’ feedback, the Brigham decided to provide individualized training on the hospital’s complicated health record software. The training was held at the clinics where doctors practice, Dudley said. Thursday’s report from the medical society, hospital association, and Harvard also urges medical software companies to design more efficient systems, including by developing apps that doctors can download to help with certain tasks, such as documenting patient visits.